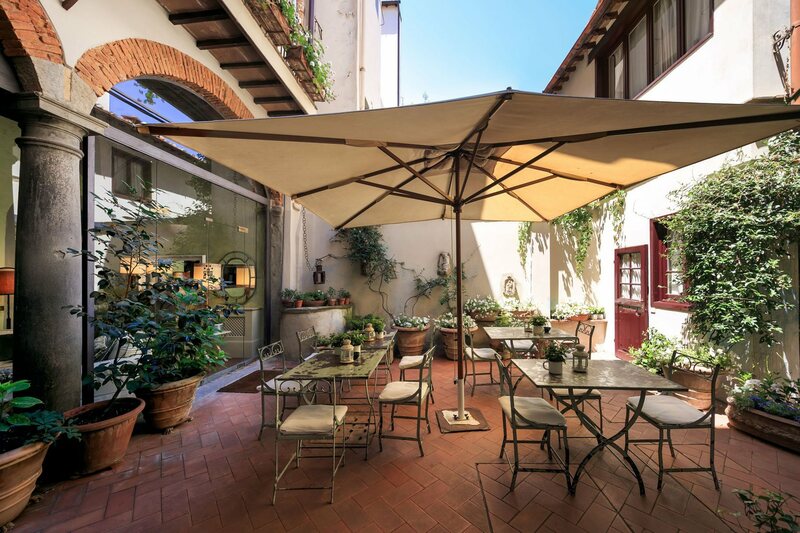 If you are planning a trip to the beautiful Italian city of Florence and are looking for excellent 4 star service and accommodations without breaking the bank, then the J And J Historic House Hotel Florence is the place to be! 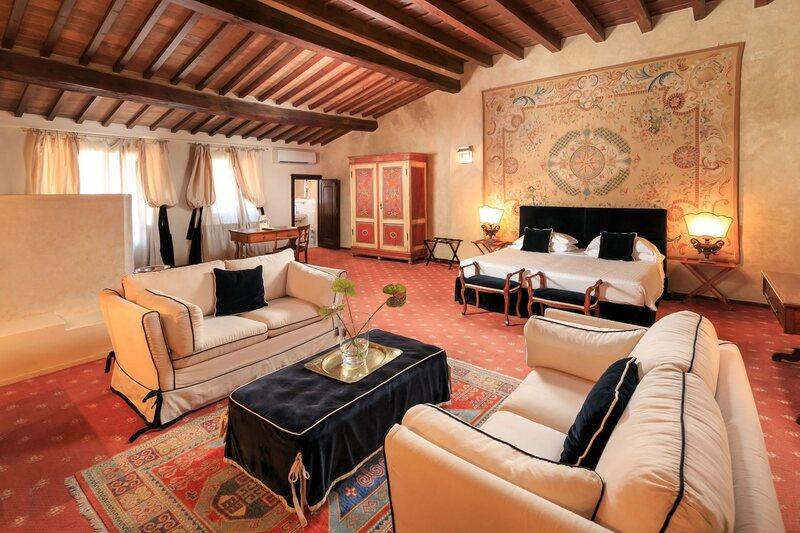 This quality exclusive accommodation offers the best of both worlds for your visit to Firenze.. While it is only a few minutes walk from the hotel entrance to many of the major sights of the city, you will find that our location is on a quiet street. Combine this with our friendly staff and comfortable interiors and you won't find a more charming 4 star Florence Hotel! 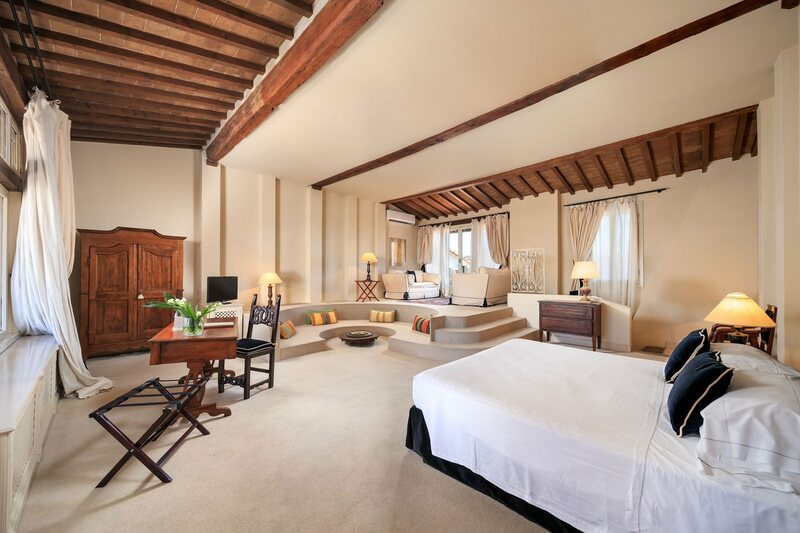 The J And J Historic House Hotel was converted from a convent and true to its past it still exudes an atmosphere of tranquillity and peace. 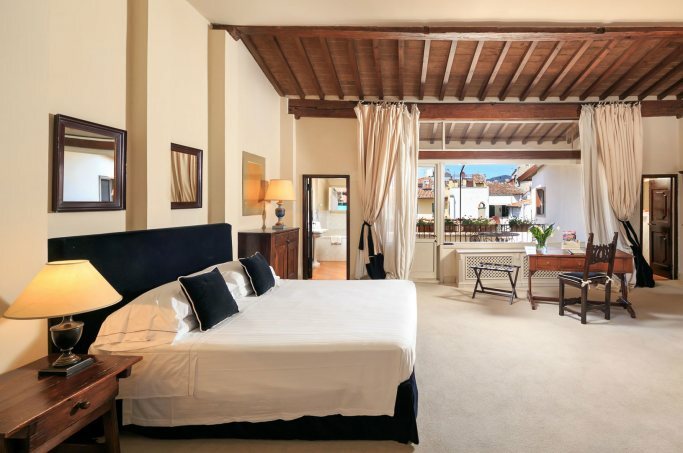 Check out some more about our Rooms and Services, and we highly recommend you take a look at our Photo Gallery and Video Tour to get a real feel for our hotel. 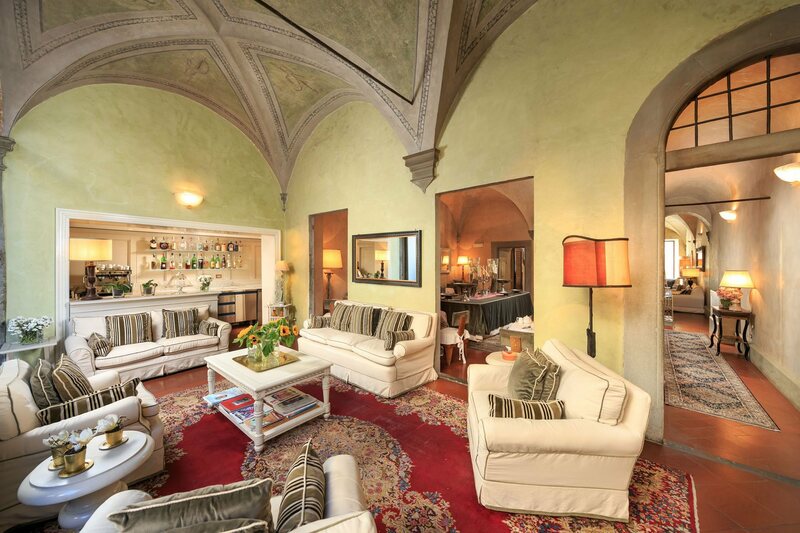 The historic building in which today we have our luxury Florence accommodation was constructed in 1564 at the time of the Medici family, Grand Dukes of Tuscany, and is located in the Santa Croce area, one of the city's most characteristic. This rather particular building has remained unspoilt over time and features its original terraced market courtyard. In Renaissance Florence, within the medieval city walls, structures such as this were not uncommon: with internal courtyards where barrels of merchandise were stored for sale through a main door and two hatches opening out onto the street. Today, this historical edifice's purpose is hospitality. 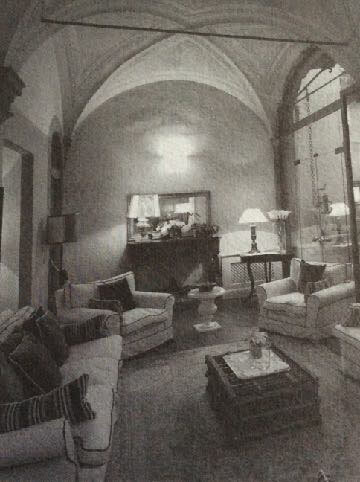 A corridor with a vaulted ceiling leads to the gallery and external courtyard. 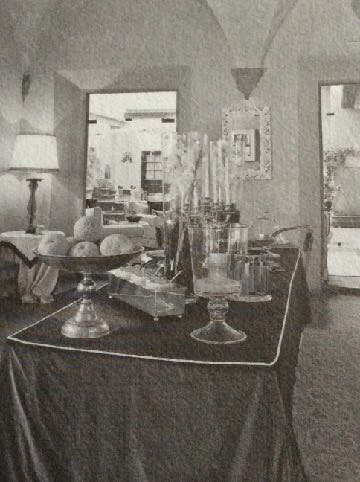 The entrance hall leads to another large space, where once upon a time fine fabrics from Flanders were displayed: toady the Hotel J and J Florence breakfast room. 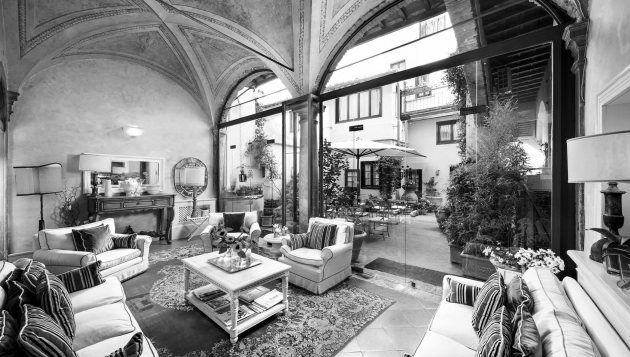 The internal courtyard has remained unchanged throughout the years, with its ornate well and gallery - today the lounge - in which guests can still admire the original frescoes of the vaulted ceiling. 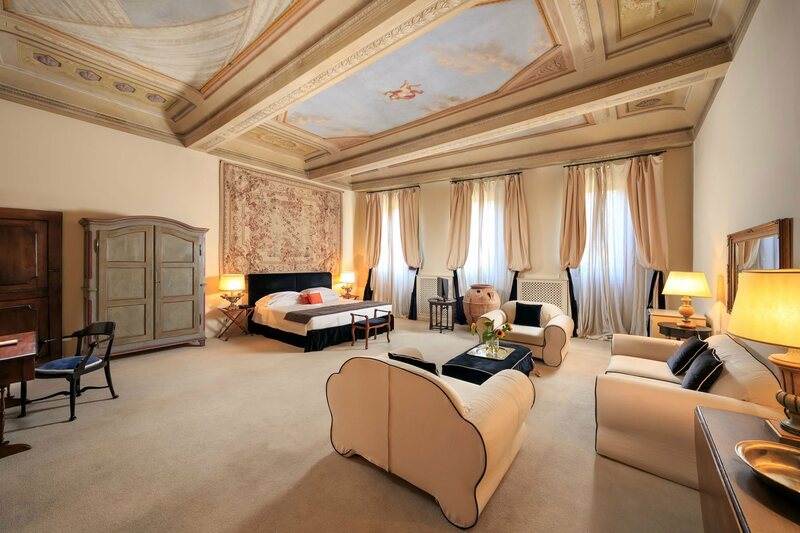 The original 16th century plaster walls are adorned with lunettes with 'fingernails' carved into waterleaf shapes in pietra serena, a motif typically found in the solid columns that support the arches of the gallery and often found in renaissance period architecture. 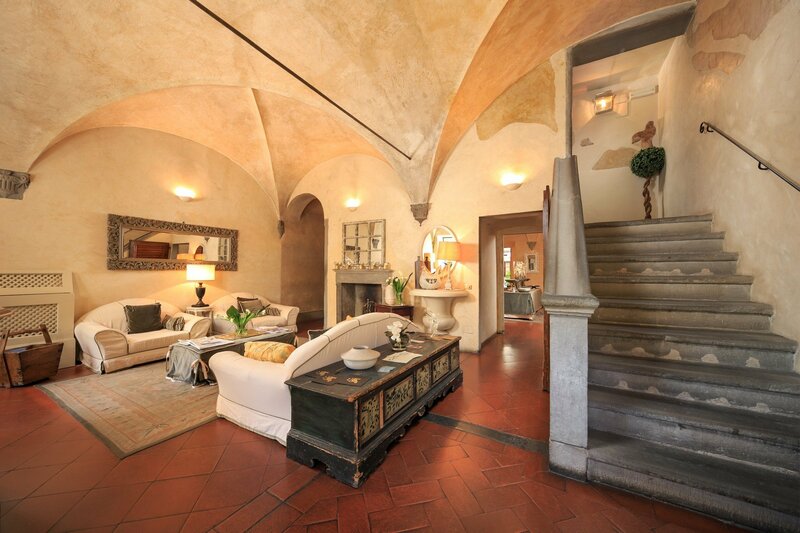 In the spacious entrance hall, today's hotel reception area, a pietra serena staircase leads up to the suites. 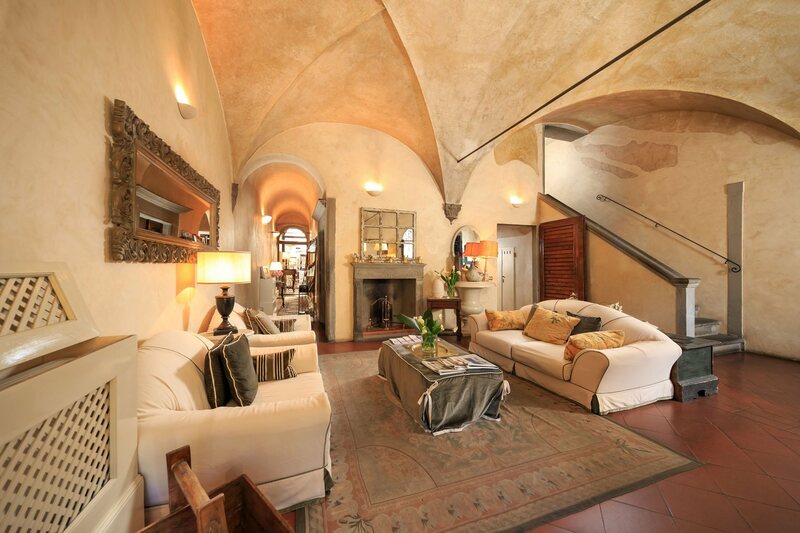 The doors are framed by decorative stone and the original ceilings - some coffered and some in later styles - feature frescoes. 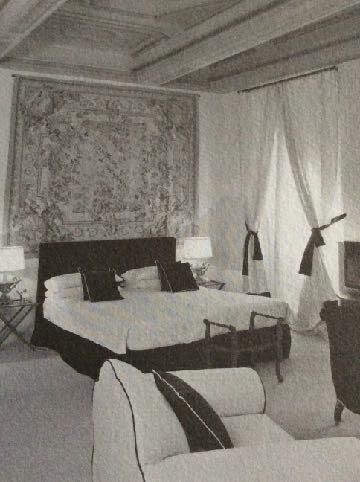 On the first floor, the suites retain their original fireplaces. 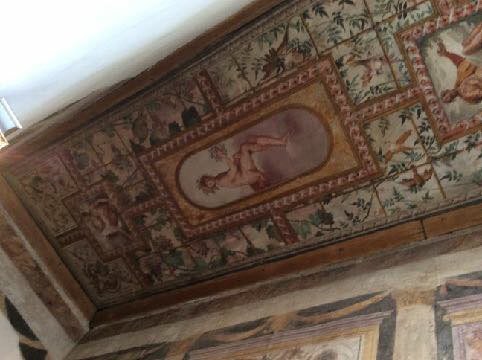 On the top floor of the building - today Suite number 10 - one can see the buffered design of a bower on the highest ceiling. In the corridors and stairwells the original lime plaster from the 16th century is still visible, uncovered following renovations. 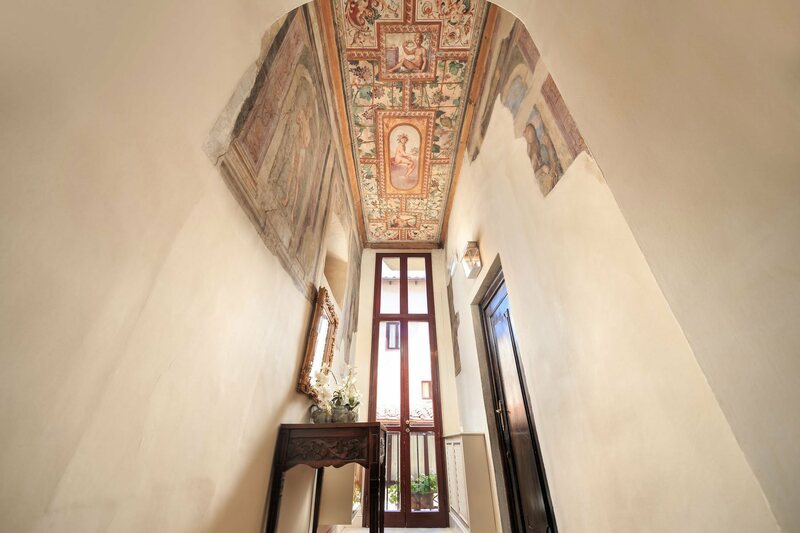 From the first floor corridor, which features original frescoes from the 1500's, an old passageway connects the main building to the one behind, where the rest of the rooms of today's hotel are to be found. Our en suite rooms, elegantly designed and furnished, offer all home comforts: wi-fi, plasma TV, mini-bar, air conditioning, outside telephone line and safe deposit box. 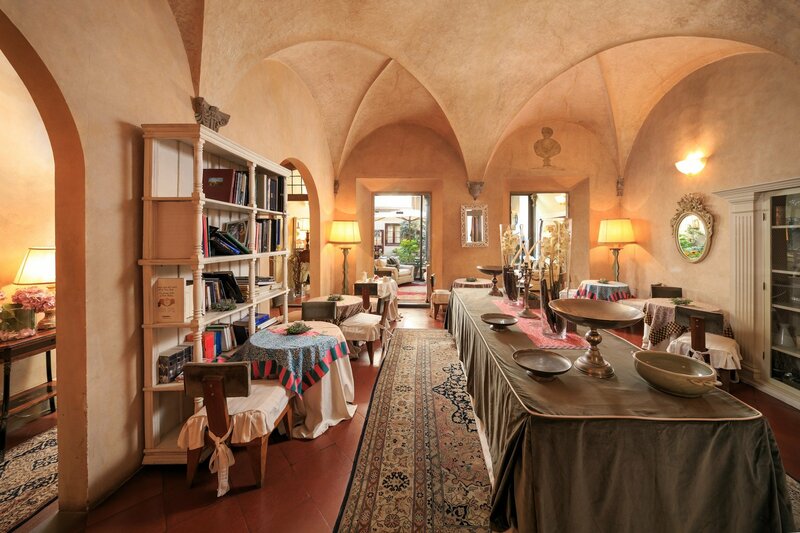 The building is located close to the most important monuments, churches and museums, reachable on foot in just a few minutes. Likewise, our vicinity to main roads leading outward from the intricate historical centre makes us easy to reach by car too. 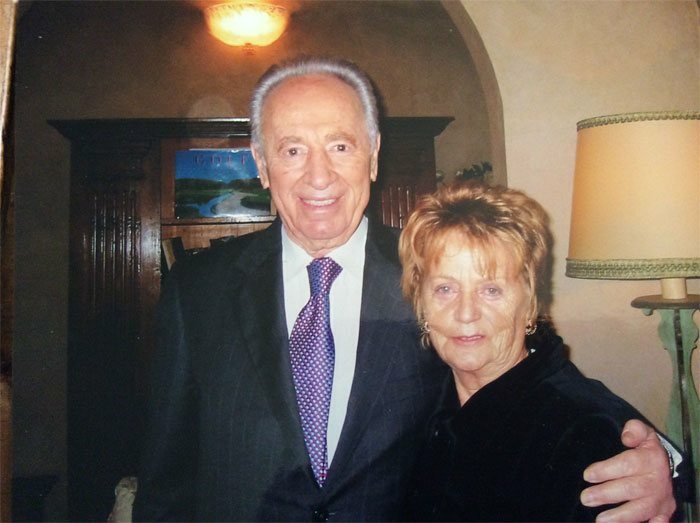 Over the years, the Residence has hosted numerous guests including illustrious names; aristocrats such as Elena Borbón, Princess of Spain; political figures such as Shimon Peres of Israel; Italian fashion designer Mila Schön; and Carmen Llera, wife of Alberto Moravia. 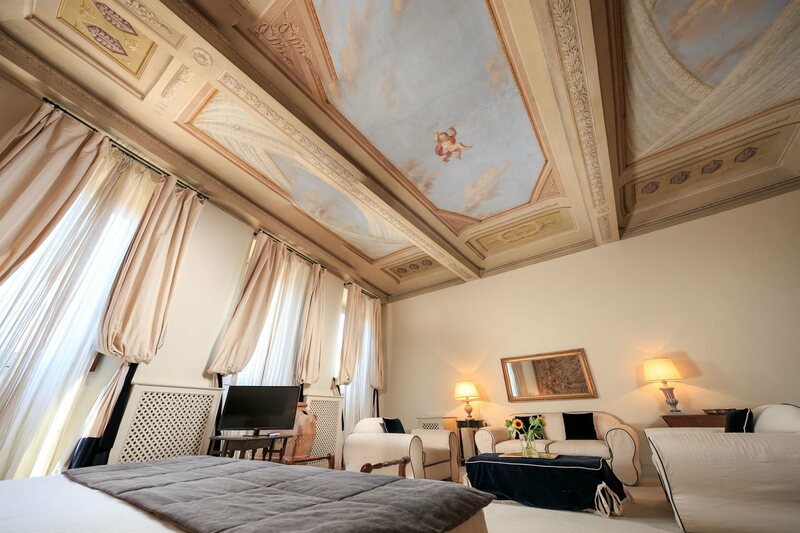 The hotel is located in the heart of Florence between the Church of Santa Croce, the Duomo and Piazza della Signoria - spots all easily reachable on foot in a few minutes. 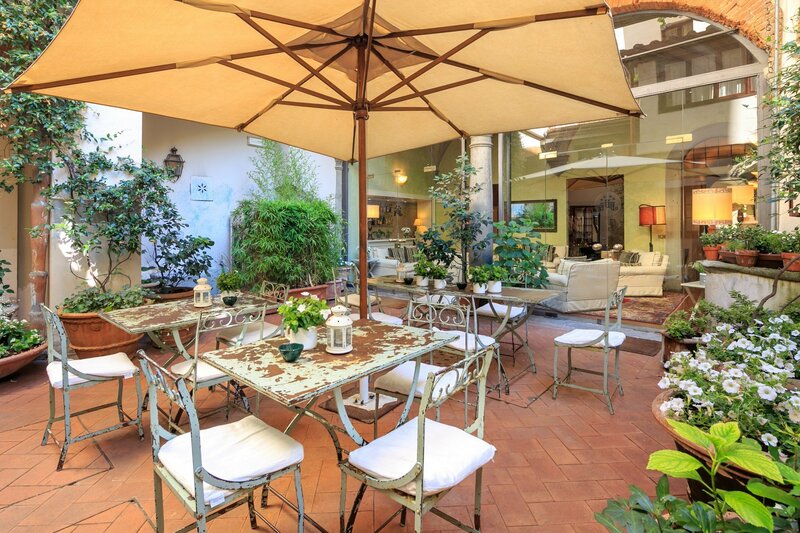 We're also nearby some of the finest restaurants in the city, such as Il Cibreo, L'Enoteca Pinchiorri and La Giostra - all of which are accessed via the tranquil Via di Mezzo. From the entrance and through our elegant Reception area we enter the Breakfast room, designed and furnished with refinement in classic Renaissance style. 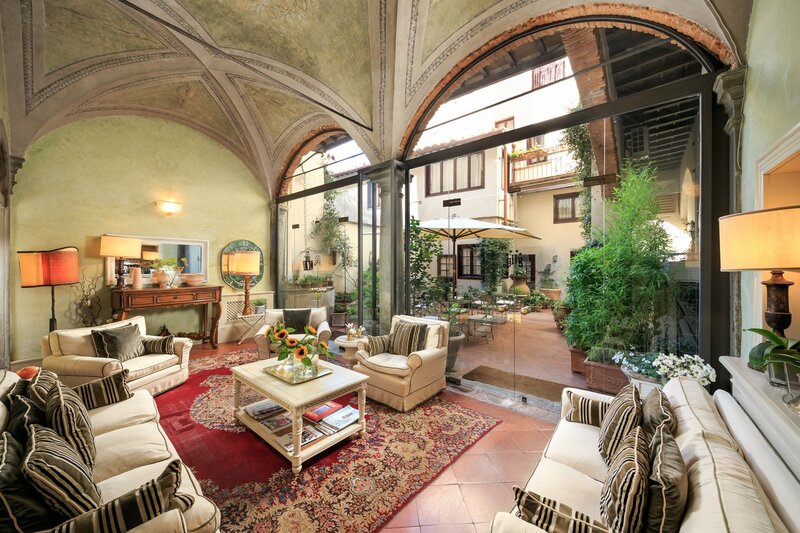 Further on we enter the highly characteristic internal courtyard where we find the welcoming yet refined Lounge bar and Reading room with frescoed ceilings. 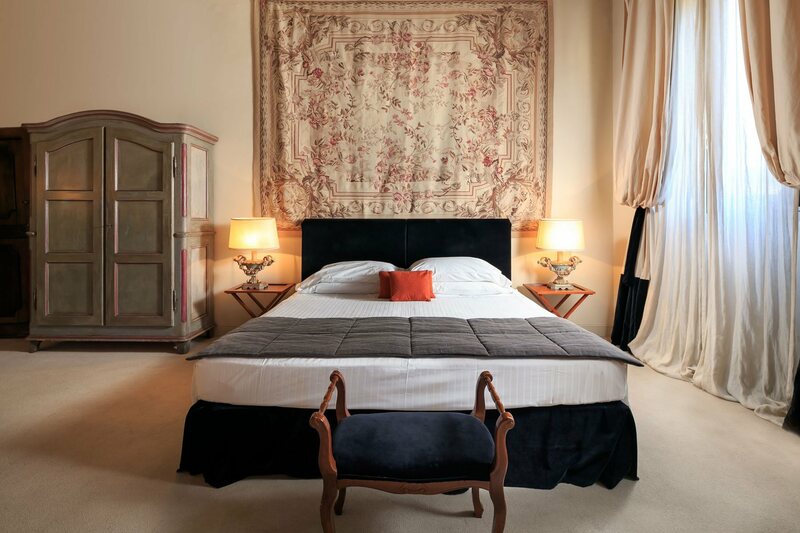 In the forty years since the Hotel J and J Florence opened we have hosted many important names including aristocracy in Elena Borbón, Princess of Spain, and high ranking politicians such as Shimon Peres, as well as Mila Schön, Carmen Llera and many others from the world of fashion, culture and cinema. Matching carpet colours to add to the warm ambience.